Shopping the Retail Attraction that Jim Bonaminio Built. In last week’s post on Tabasco I mentioned a local retailer that many of you, I’m sure, have never heard of before. Jungle Jim’s International Market is a local treasure in Cincinnati. Shopping at this store isn’t so much a weekly chore as it is a fantastic adventure in flavors–and that’s just how Jim Bonaminio wants it. Take a look at the shot above of the over 1,400 varieties of hot sauces available. With roots beginning in 1971 with a humble road-side produce stand, Bonaminio has built his international market to include arguably one of the country’s best selections of virtually any grocery item from around the globe. 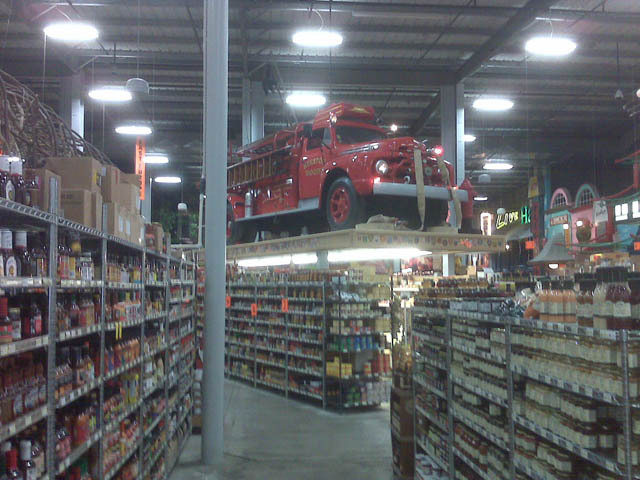 With a style that can only be described as over-the-top, Jungle Jim’s is much more than a grocery, more than a superstore—it is a mecca for foodie’s and the general public alike in the Greater Cincinnati and surrounding area. As you approach the Fairfield, Ohio location, it becomes very apparent that Jungle Jim’s is a special place. Road signs and even the parking lot are more reminiscent of a theme park than a grocery store, not to mention the monorail. As you leave your vehicle behind, the sights and sounds are that of a safari, stadium or county fair. There is excitement all around. Inside the over six acres of retail space is no different. But this is not the typical big box store. Although under one roof, the location is better described as a collection of linked destinations—each with their own style, sights and sounds. Individual departments are promoted through the use of specific displays and aesthetic cues. Shoppers are entertained by a singing Elvis, Robin Hood and any number of other personalities across the aisles and departments. There is something here for everyone.